Why travel to Mt. Hood and the Columbia River Gorge by car when you can see and experience it a number of other (likely cooler) ways? Adventure is waiting for you here, now's the time to jump in and participate. 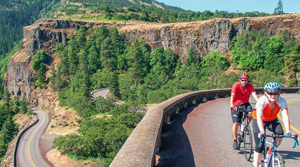 Adventure by air: Ditch the road traffic and jump on a scenic flight with Envi Adventures to soar along the Columbia River Gorge and over the Mt. Hood National Forest. 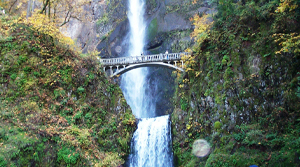 Fly over the paths of dozens of rivers and waterfalls. Glide across snow covered forests and nearby towering Mt. Hood. This is by far the easiest and most beautiful way to skip parking and road traffic stress. Adventure by boat: One of the best ways to learn about the history of the Columbia River Gorge is to get in it. 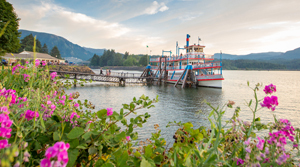 Jump aboard the Columbia Gorge Sternwheeler in Cascade Locks to get 360 degrees of breathtaking views. And don't forget your history. A ride on the Sternwheeler is one of the best ways to experience the history of the Lewis and Clark Expedition and to watch the Native American tribes fishing from their platforms along the river, a tradition that is centuries old. Adventure by jet: The Columbia River isn't just for boats. Embrace your inner dolphin and jump in (and out of) the water with Gorge Flyboard. 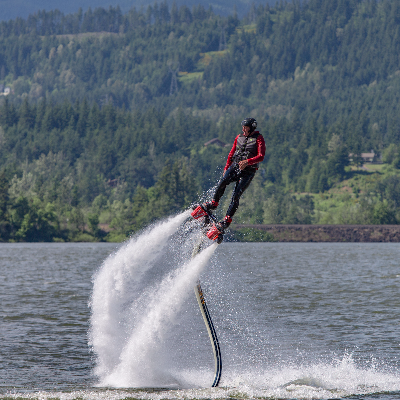 Let the water jet packs help you soar you in and out of the water as you wave at boaters passing by, all while enjoying the stunning scenery of the Columbia River Gorge. Adventure by whitewater rapids: The Clackamas and Sandy Rivers are bursting with whitewater rapids each spring, beckoning you for a wet 'n wild ride. Go with a group in a raft or solo in a kayak. Put the logistics and safety in the hands of others so you can enjoy every moment out on the river. 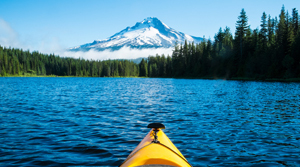 Check out guides like Alder Creek Kayak and Canoe and River Drifters who can help you plan your next trip. 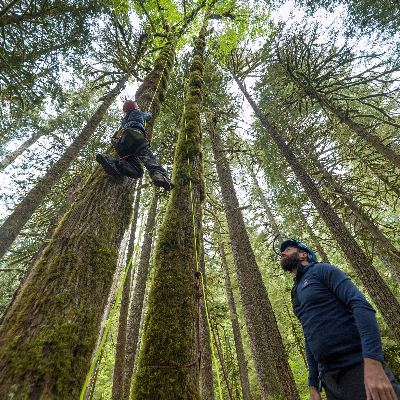 Adventure by scaling trees: Climbing up a douglas fir to reach the top of the tree canopy in the Mt. Hood National Forest is an experience you will never forget. With the help of Expedition Old Growth, you and your family can reach for the stars (or tree limbs) as you experience life among old growth forest. Your perspective will shift. Your senses will be heightened. And you will have more fun than you can possibly imagine. Which adventure do you plan to choose next?